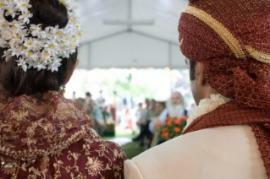 An Indian traditional wedding ceremony is complex and filled with rituals. The nuances can vary greatly based on region and language. Modern Indian couples often create custom wedding ceremonies to highlight meaningful and special aspects of their heritage. These often include traditional Indian aspects of the wedding ceremony. Although arranged marriages are controversial in modern times, this act was a traditional part of an Indian wedding. Even for those who have stepped away from enforcing this ritual may involve their families, sometimes very significantly, in the spouse decision. Var-iksha is the term that may be used for the informal agreement between a bride and groom and their families for the marriage. The Tilak is the term that may be used for the formal engagement of the ride and groom. This was traditionally celebrated at the home of the groom's family where the bride's immediate family and some extended family might be present. Removed from many modern ceremonies, the Varmala or Jaimala is the traditional method to the start of the ceremony. The groom, his family, and friends, would arrive at the bride's residence in a procession called a Barat or baa-raat, traditionally after midnight. This would be considered the more public ceremony, and the bride, in elaborate Indian wedding dress, and groom, in handsome traditional attire, would have a symbolic exchange of garlands. Guests offer congratulations and this part of the wedding is culminated by a meal or feast is served. 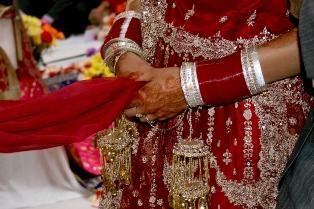 (For visuals of women's wedding ensembles, see this Photo gallery of Indian Wedding Dresses). The bride and groom's attire may be tied together to epitomize their union. Each vow will be verbalized with the couple walking around the ceremonial fire. A traditional wedding gift during the Indian wedding ceremony is the presentation of a mangalsutra, or necklace, from the groom to the bride. He may also place a red powder in the part of her as a visual signification of the marriage. Following the final step and vow, the groom pronounces his desire for lasting friendship with the bride, and the Phere is complete. The father of the bride may give a libation and prayers for the new couple, and they are formally pronounced man and wife. The vidaai is the final step of the Indian wedding ceremony. This is the ritual by which the bride leaves her family and enters into the grooms. Families say farewell and may show physical affection, verbal blessings, and gifts. The groom may be given a traditional forehead mark by friends and family to symbolize saying farewell. Although in historical Indian ceremonies the bride would be taken away in a Sedan chair, modern couples depart in a decorated wedding care or limousine, and their new life begins.